Balding, probably in his 50s, an extravagant mustache. He was seen clinging with five other survivors to the tail section of the airplane. This man was described by Usher and Windsor as appearing alert and in control. Every time they lowered a lifeline and floating right to him, he passed it on to another of the passengers. “In a mass casualty, you’ll find people like him,” said Windsor, “But I’ve never seen one with that commitment.” When the helicopter came back for him the man had gone under. Still, he could never have imagined such a capacity in himself. Only minutes before his character was tested, he was sitting in the ordinary plane among the ordinary passengers. Just imagine, every time the life ring is dropped, you hand it off to someone you don’t know…serving them but putting your own life at risk. Thankfully, none of us will have to endure this kind of test. However, every day as leaders we face much smaller yet still important tests of our character. We enter ordinary offices (or) families with ordinary people and then suddenly something goes wrong. Things don’t work out the way you hoped. Someone has to make a sacrifice. How you react at that moment defines your leadership style. When you’re sitting on the plane or sitting here this morning, you can say whatever you want about your leadership style, but it’s at moments like these; when circumstances force you to display your leadership. That’s when everyone finds out your true leadership character. What characteristic or adjective describes your leadership style? Jesus’ servant leadership is best summed up by Paul in Philippines 2:3-8. In one corner, is vainglory. My definition is pride hiding behind virtue. Jesus tackles vainglory in the sermon on the mount. Turn to Matthew 6:1-18. “Beware” is Jesus’ warning. Don’t be deceived into thinking God applauds your life when you are really living for the applause of others. Jesus illustrates the absurd with the absurd (vs. 2) “When giving to the needy…sound no trumpet before you.” Imagine passing around the offering basket today and as it’s comes down your row, you scramble through your purse in order to pull out your checkbook and trumpet! (Da…ta..da !!) “Thank you! I just dropped in my check.” It’s ridiculous. Yep, and it’s also just as ridiculous to give to needy people in a way which draws attention to yourself. Jesus offers a solution: “When you give, do not let your left hand know what your right hand is doing” When you give with one hand, don’t pat yourself on the back with your other one. Don’t seek applause from others, don’t even seek applause from yourself. “Giving to the needy” is not just limited to giving money. It could be about giving your time or talent, but you’re still looking for applause. Preaching in India was a unique experience for me. For safety reasons they had me wait outside in a truck until it was time for me to come on. When it was time, I preached to a crowd of about 2000 people, but immediately after I was done, for the same safety reasons, they took me away. I walked off the stage, got in a truck, and they drove me away. I was in the back seat of the truck with two guys I had never seen before. Also neither of them spoke English. For an hour we drove through the dark back to the hotel. As a pastor who is so used to getting instant feedback from my congregation, I couldn’t help but keep asking myself, “how’d I do?” I realized how much I hungered for applause. In this case, it would never come. Jesus tells us to give and not expect applause from others. Do you ever pray, and at the end of your prayer you hope someone is impressed with you? Do you see how ridiculous this is? The primary purpose in prayer is to make God’s name great. “Hallowed be your name.” Yet, you use prayer to make your name great. Its vainglory hiding behind virtue. We all understand what Jesus is trying to uncover. Bragging while hiding behind a virtue. Bragging behind a false humility is so common, it actually has a name now: Humblebrag. So blessed to be watching the sunset from my balcony in Hawaii. Do you practice your life with Jesus in a way you hope is noticed and applauded by others? Or if not, do you applaud yourself? That’s Vainglory. In the Other Corner: Servant Leadership. Jesus became the perfect example of humility when he took on the very nature of a servant. Humility is not thinking of less of yourself, but thinking of yourself less. In 1 Peter 5:5, we are told to “clothe yourselves with humility.” The word “clothe” means to “tie it on”, or “make a knot”, like you would tie an apron. It’s a command to action. Humility is not something you wait for to grow, it doesn’t grow naturally, it must be cultivated. Peter’s instructions are informed by his personal encounters with Jesus. So when Peter says, “Tie humility around your waist like an apron” he must have been thinking of The Last Supper. Recall Peter and the other 11 disciples in the upper room. As they enter, each one walks right past the foot washing station. As Jesus is trying to discuss with them his coming suffering and death, a long standing dispute breaks out among the disciples: Who will be the greatest? This must have been so painful to watch. As all 12 men are taking hits from the helium tank of pride and puffing themselves up, where is Jesus? (John 13) Jesus gets up from the table, lays aside his own garments and ties on the towel of a servant. One by one he washes the bloated feet of the disciples. The Creator bends down to serve his own creation. 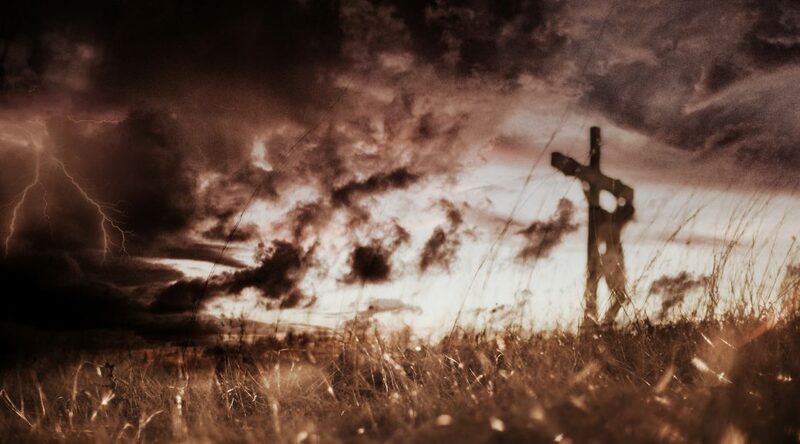 A day later he hangs on a Cross, handing the ring of life to us while he dies. That is servant leadership. 1. The Man in the Water – Where are the places in your ordinary life that your character is tested? What’s challenging about handing the life ring to others rather than taking it yourself? 2. “Vainglory” – Pride hiding behind Virtue. Why is it difficult to detect pride in yourself? Discuss the challenges of living a virtuous life without living for the applause of others. Discuss how men humblebrag. 3. “Humility” – Not thinking less of yourself but thinking of yourself less and less.” Humility is not something you wait for to grow. It doesn’t grow naturally. It must be cultivated. – How do you cultivate Humility?